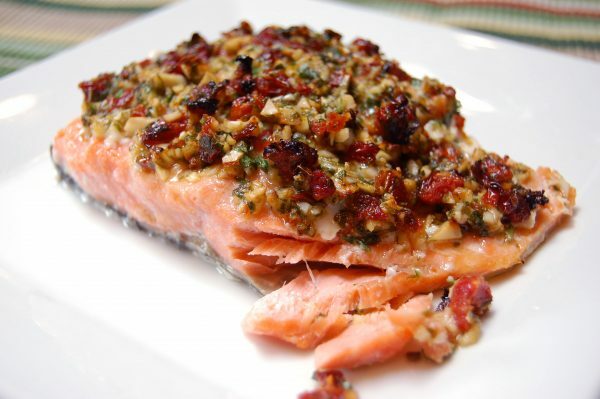 This baked salmon recipe is from Canadian Barbeque Champion David Veljacic who had been barbequing competitively for eight years and capturing awards internationally for his salmon dish before taking the granddaddy of all barbecue prizes from the Kansas City Barbeque Society. The recipe is fantastic with fresh salmon either grilled or baked in the oven. Sprinkle the garlic and salt in a shallow dish. Mash the garlic with the blade of a knife. (Jan’s Note: I simply chopped the garlic on a cutting board, added the salt into the garlic and continued to chop until garlic and salt was incorporated and minced.) In a small bowl, combine mashed garlic, parsley, tomatoes and oil, mixing well. Cover and refrigerate for 8 hours or overnight. When ready to barbecue, cut two lengthwise slits in the salmon fillet with a sharp knife, dividing the surface of the fish into thirds. (Cut to the skin but not through it.) Spread half the garlic mixture over the fillet and into the slits. Place the salmon, skin side down, on a greased grill rack. Cover the grill and cook over low heat for 10 to 15 minutes. Spread the remaining garlic mixture on the fish. Continue cooking, with the lid down, over medium heat for 15 minutes, or until fish flakes easily. Remove from the grill by inserting spatulas between the skin and the flesh, lifting the fillet, and leaving the skin on the grill. Serve the skinless, boneless fillet on a bed of fresh greens. Yields 4 servings.